Cook the pasta in boiling water at high heat until it's finished cooking. Strain the pasta and rinse with cold water. Mix the pasta with all the ingredients (except the lettuce) in a large bowl. Season with salt and pepper to taste. Refrigerate for at least 30 minutes. Add the lettuce just before serving. Enjoy! This recipe can be prepared a day in advance, but without the lettuce. Add the chopped lettuce right before serving. Can you guess what my favorite summer activity is? I'll give you a hint: it's an outdoor activity to be enjoyed with family. It includes a blanket to sit on and a basket filled with snacks or a whole meal to share with the people I love the most. If you guessed picnic, you're right! 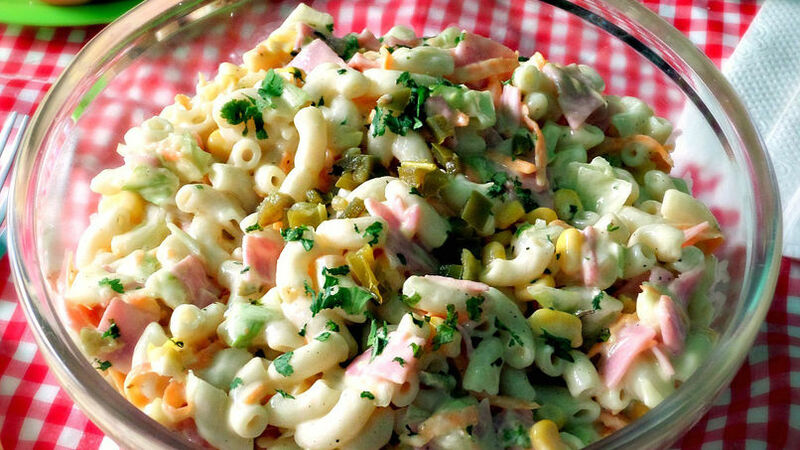 And if you like picnics as much as I do, then I know you'll love this fresh salad with ham, corn and jalapeño. It's perfect for a picnic at the park or beach.